Well, we have a title! TRUTH, LIES AND LEWIS BLACK is shooting in Burbank on August 15-16 ... woo hoo! We've got our first cut coming out today, and we're looking to have this puppy ready for a screening sometime in the fall. Meantime, Lew has movies and a tour and all sorts of madness coming up...and I'm working on two new projects for History with the amazing folks at Ten Worlds. I'll be posting info about the shoot when we're ready to invite folks...or you can go to Lewis' site and sign up to get his emails. ...and since the Apollo script has gone to the editors, I am finally getting some work done on the Cornerstone 20th Anniversary video. DECLASSIFIED is back in reruns...Monday will see the return of THE AYATOLLAH. It's fun to see them pop up on TiVo when you least expect it. I've finished revisions on the script for our Apollo show, and it's also been handed to the very funny and very talented John Bowman for some juice. It was tough because I had to work hard to get that DECLASSIFIED guy out of my head. 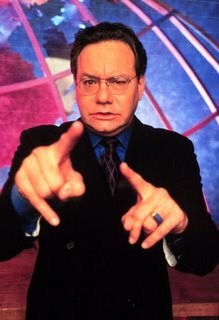 I had to make way for the guy who's going to be laying down our Deathless Prose for the ages...In a little less than a month we'll be taping with the amazing LEWIS BLACK. Again, lucky for us we've got the help of John Bowman. I'm working on the live segments again this week...it's going to be a blast. The only problem now is that we've got way too much stuff coming in...there's all sorts of other pots bubbling, and not enough hours in the day.